This entry was posted in Animal glue, Distractions and tagged glue. Bookmark the permalink. Thank you Jack for posting this. Over my 34 years as a restorer I have had a more conservation ethic to my work either when I was employed or within my own workshop. Over that time I have on many occasions had to discuss projects with museum based conservators. And simple we talk a different language we also work a different way. It’s institution versus commercial. Plus also spending two years retraining in my early 30s and the parallel group were training conservators they were shown to carry out none invasive work which is ok for a piece of furniture that would be roped off never used or even moved. But furniture was not designed to be on show it was made for people to physically use. The restorer in me got very frustrated by the very narrow mindedness and they over reliance of science to show how a project was to be carried. Sadly in the outside world that table or chair would fall apart if a 20st man used it. 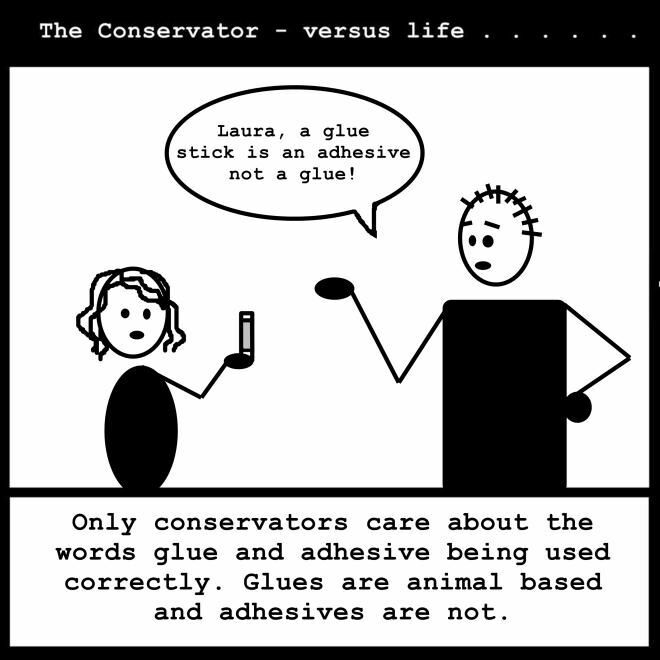 This image show that difference and I would recommend conservators be a lot more open minded. And then there is the all too common occurrence where some well meaning family member of one of my clients tries to facilitate a repair by injecting as much pva into a damaged/opened/eased/destroyed/etc joint as humanly possible and then they ask me to fix it. It wouldn’t bother me so much (most pieces are more sentimental value then anything else) if they did a good job of it. I had to cut through two dowels on the last piece of furniture to get the components apart without the timber splitting to pieces and causing even more damage. Bridging a 3mm open joint with pva is no mean feat ;) Would that make it a wood filler?